Tonight’s game against Manchester United ends 112 years of history at Boleyn Ground for West Ham supporters. As the club moves to the Olympic Stadium, it sets new record for season tickets. It hardly began as beautifully as planned. The Farewell Boleyn game against Manchester United began with crowd attacking the visitors’ bus before the game, when it arrived surprisingly late and got stuck in the thick crowd around Boleyn. This caused a 45-minute delay of the match, eventually won by WHU 3:2, providing great spectacle for 34,662 people in attendance! Tonight’s match was the very last played by West Ham United at Boleyn Ground, the stadium they had been using since 1904, for long 112 years. After this season comes to a close, West Ham will focus their energy on relocation to the Olympic Stadium. First elements of Boleyn are already on their way to the new home. 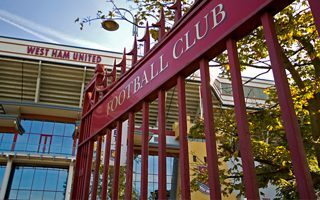 The famous John Lyall Gates were removed from Upton Park in March and await installation as part of the décor at WHU’s new club megastore, recently approved for construction. While these symbolic elements will be transported, many others are to be auctioned. Starting on May 18 and lasting well into June, auctions will include goalposts, corner flags, substitute seats, bubble machines and numerous others elements of the stadium equipment, like furniture from dressing rooms and offices. Starting prices vary, but will soon be irrelevant, because it seems many fans will be eager to outbid others. West Ham are making the most of what they have before relocating to the Olympic Stadium for the entire 2016/17 Premier League. As it was announced this week, the club has already sold all 50,000 season tickets for the upcoming campaign, setting a new record. As the Hammers settle in their new residence for 99 years, Boleyn Ground will be replaced by 838 flats. There were fewer planned back in 2014 (700), but the number is now more impressive. New chapter for West Ham will begin on August 7, when the team face Juventus in opening game.